After launching ‘Jaago Re’ earlier this year to highlight the necessity of pre-activism, Tata Tea now moves its campaign to phase 2, which aims at gathering 1 million pledges from citizens of India, to make the country better for women and sportspeople. Tata Tea launched its iconic campaign Jaago Re 2.0 - ‘Alarm Bajne se Pehle Jaago Re’ - earlier this year, urging people to pre-act before tragedies hit. The campaign is now moving into its second phase, urging people to drive the change they wish to see. 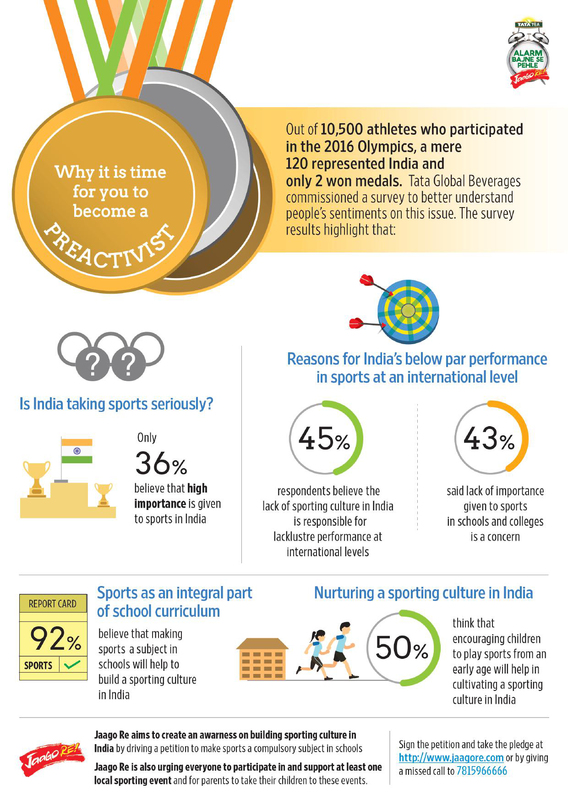 While the first phase of the campaign showcased the ‘reactive’ nature of people and introduced a new form of activism – ‘pre-activism’; the second phase aims to inspire people to drive a behavioral change by signing petitions on issues currently plaguing the country – Women Safety and Sports Encouragement. 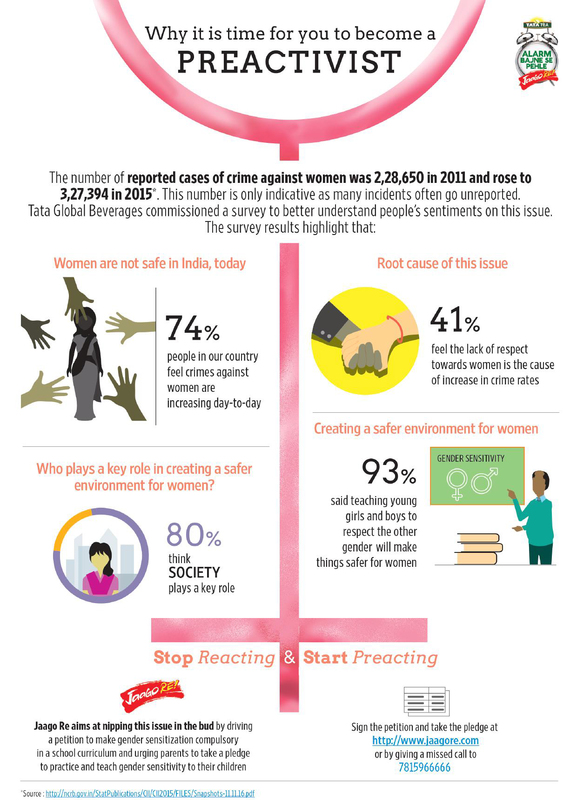 Tata Tea believes that an issue as grave as women safety will not end till the root cause of the problem is tackled, and the onus of bringing about this change lies with us. The lack of respect towards women, and the fact that they are considered the weaker gender is one of the reasons behind increasing violence against them. Tata Tea is trying to bring about a change in attitude by encouraging people to pre-act and educate children to treat all with respect and equality. This positive attitude will translate into a safer environment for women in the future. Tata Tea’s petition for women safety is therefore to make ‘gender sensitization’ programs compulsory in school curricula and teach young minds to respect men and women equally. Each petition is followed by a pledge for parents to practise and teach gender sensitivity to their children. Tata Tea further believes that in order to become a great sporting nation, there is a need to build a sporting culture first. The petition for sports encouragement is to include sports as a compulsory subject in schools. Tata Tea also encourages people to participate in and support at least one local sporting event and to take their children for one of these sporting events at any level, be it at the neighborhood, state or national. Commenting on the new phase of the Jaago Re 2.0 campaign, Sushant Dash, Regional President - India, Tata Global Beverages, said, “Pre-activism is about nipping the problem in the bud. In this phase, we are aiming to create over 1 million pre-activists who will sign the petition and pledge to bring about a real change. In addressing issues as pressing as crimes against women, we need to bring about a shift in attitude and teach young children to respect all genders. Therefore, gender sensitization at grass-root levels is critical to bring a wave of change and create a more gender equitable society. To instill the message of pre-activism and drive the conversation on change, social activist Dr. Ranjana Kumari and Olympic sensation Dipa Karmakar will be the torchbearers of the campaign and will lead the issues of Women Safety and Sports Encouragement, respectively. They will share their views on these issues, create awareness and inspire people to take action by signing the petitions and taking the pledge.